Pork, because of its high proportion of fat, is considered lucky in many countries, such as China and Italy. Our Tomato-Glazed Stuffed Pork Loin provides lots of immunity-building nutrients—vitamin B6, vitamin C, zinc, selenium and antioxidants—to keep you healthy and lucky throughout the new year. 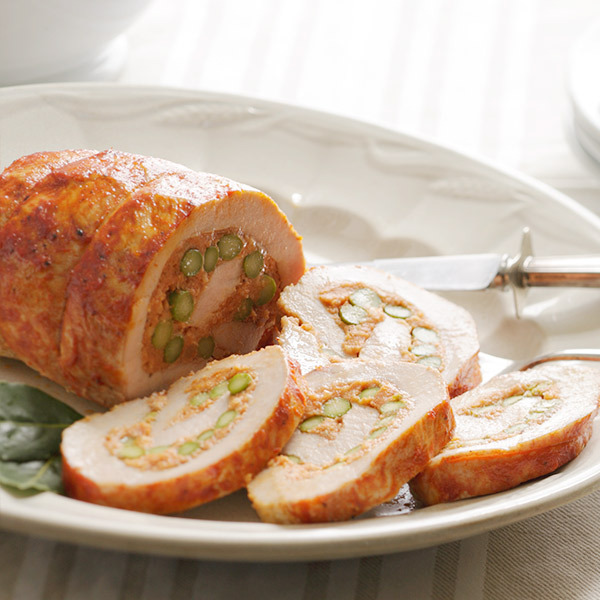 Stuffed with asparagus, almonds and white beans, this roast pork loin recipe offers a unique presentation. Preheat the oven to 450°F. Grate the zest from half the orange and set aside the zest. Squeeze the juice (you’ll need 5 tablespoons). In a small bowl, combine 3 tablespoons of the orange juice, 3 tablespoons of the tomato paste and 2 teaspoons of the oil. Set aside the glaze. In a mini food processor, combine the almonds and garlic, and process. Add the beans, remaining 2 tablespoons tomato paste, the orange zest, 2 tablespoons of the orange juice and ¼ teaspoon salt. Process to a puree. With a sharp knife, make a lengthwise cut into the pork loin about ½ inch below the top. Continue cutting, following the shape of the roast, as if you were unrolling a scroll. You’ll end up with a piece of meat about 9 by 13 ½ inch. Sprinkle lightly with salt and pepper. Spread the bean mixture over the pork, leaving a 1 inch border all around. Lay the asparagus on top in the same direction as the grain of the meat. Starting at a short end, roll up the roast. Tie in four places with kitchen string. Add the remaining 1 tablespoon oil to a roasting pan. Turn the roast in the oil, and then season lightly with salt and pepper. Roast for 10 minutes. Brush with half the orange-tomato glaze. Reduce the oven temperature to 325°F. Roast for 30 minutes. Brush with the remaining glaze and roast for 40 to 50 minutes, until the pork reads 145°F on an instant-read thermometer. Let sit for 15 minutes before slicing (the temperature will go up to 150°F).